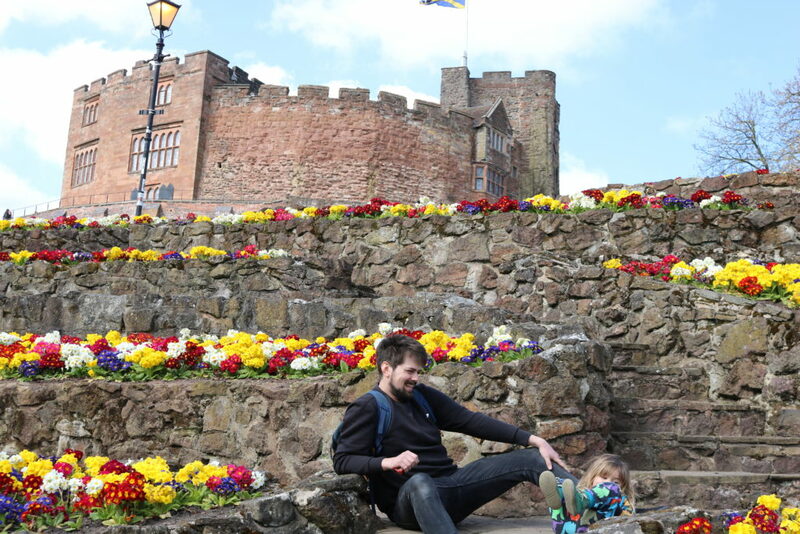 We just had a super spontaneous trip to Thomas Land and stayed overnight in Tamworth a few days ago! 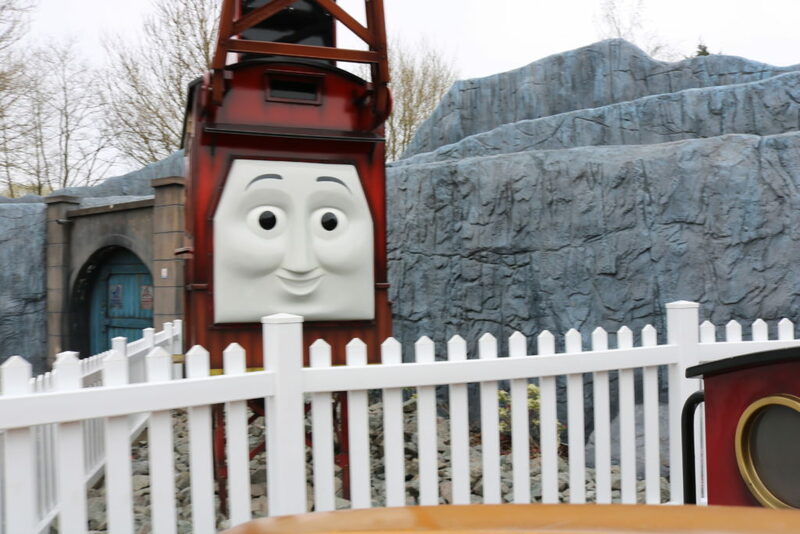 Thomas Land has been on my ‘bucket list‘ for some time now and I’ve been dying to take Eric. He loves all things Thomas & Friends and ummm, so do I!!! I’m 27 but I still love Thomas, haha. 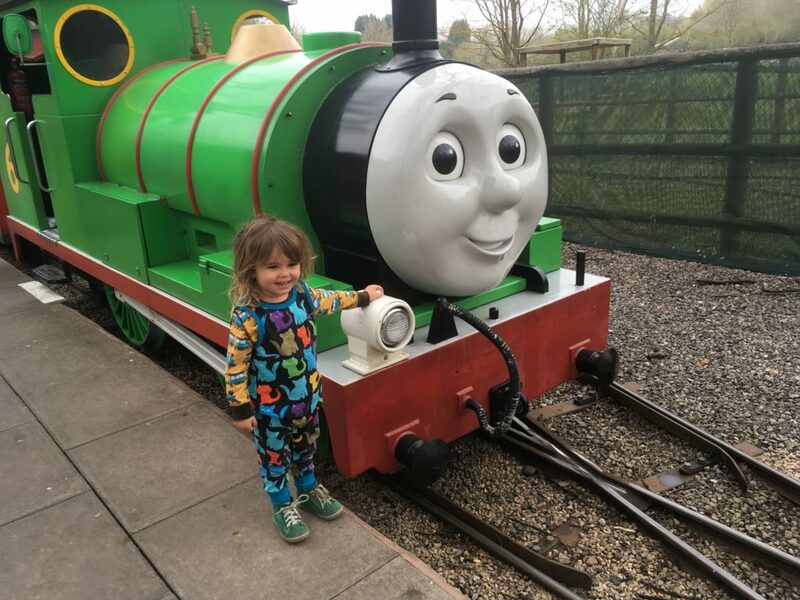 Eric’s special thing for his 2nd birthday was day out with Thomas which was a fantastic day out, he really liked Thomas & Friends at Mattel Play in Liverpool so I knew he’d like Thomas Land. 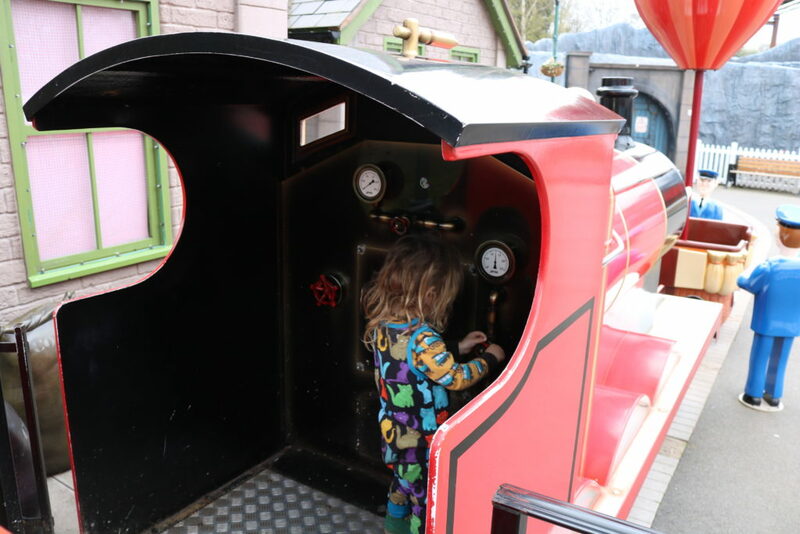 I’m usually all about getting the cheapest deal so it was really surprising we went to Thomas Land at the weekend when it’s the most expensive! 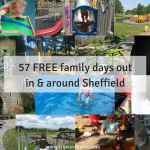 I’m always recommending term time deals and Adult & Toddler deals for attractions as these tend to work out the cheapest (however I understand for many it’s not doable). 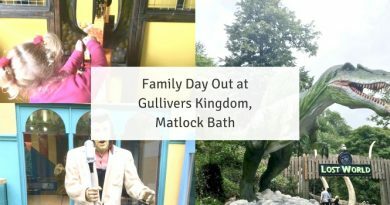 For us we went on the Sunday and it worked out nearly £60 for all 3 of us which is one of the most expensive days out we have had in years… Factor in our travel and overnight hotel before (to get a full day at Thomas Land as we don’t drive) it was a big expense. 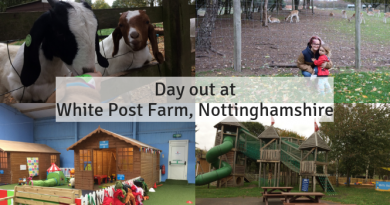 Our tickets were bought from the hotel (Holiday Inn Express) but same rate as the online discounted tickets which is: Adults £28 or £39 on the day, Over 4’s £24 or £29 on the day, 2-3 year olds £8. 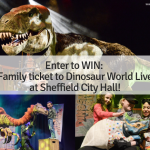 Adult & Toddler tickets are very good value for money at £24 for 1 adult 1 toddler but only during term time week day and include only 1 adult (extra adult would be full price). In hindsight I really wish we had gone during term time to save some money (£52 for adult & toddler plus 1 extra adult) but I’m due a baby very soon and this was our only chance to go before the baby comes. It was either then or during their Easter event weekday which is the same price as we paid, anyway. 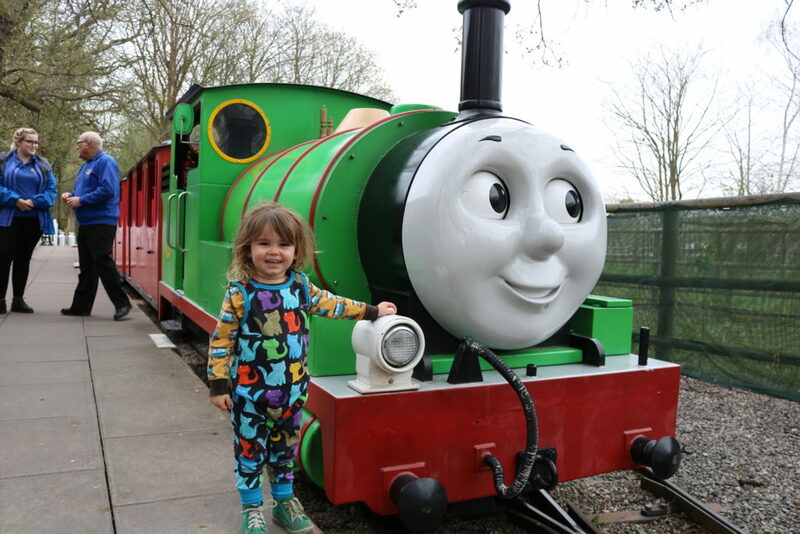 There’s 25 Thomas themed rides and attractions at Thomas Land, there really is loads to see and do there. 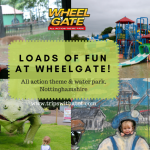 You can easily spend the day just at Thomas Land but there are other things to do at Drayton Manor, too. The height restrictions I found to be pretty relaxed, but there was 5 rides Eric couldn’t have gone on and he didn’t want to go on them anyway. We don’t go to theme parks often at all, though, so I don’t have much to compare to apart from Sundown Adventureland. He is just about 90cm and he’s 3 and a half. 5 rides were for over 90cms only but mostly, they were all suitable for under 90’s with an adult rider to accompany them. 2 rides were not working on the day. 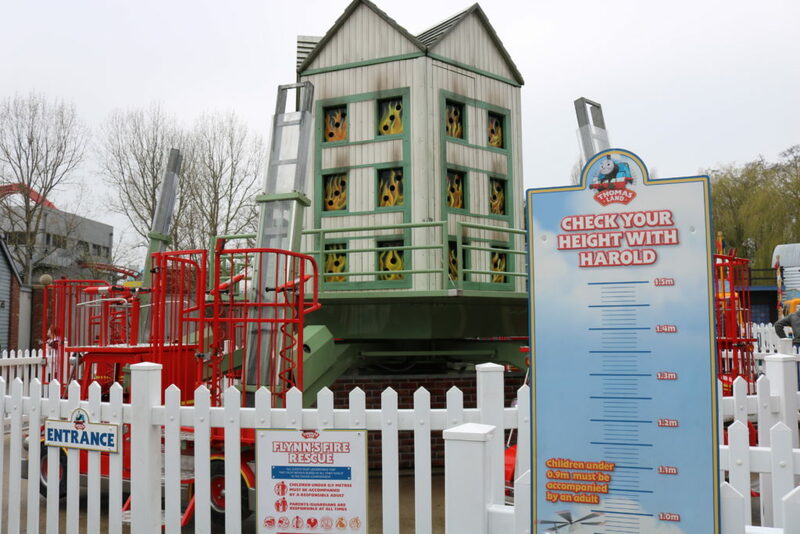 There’s a Harold height chart at each ride. 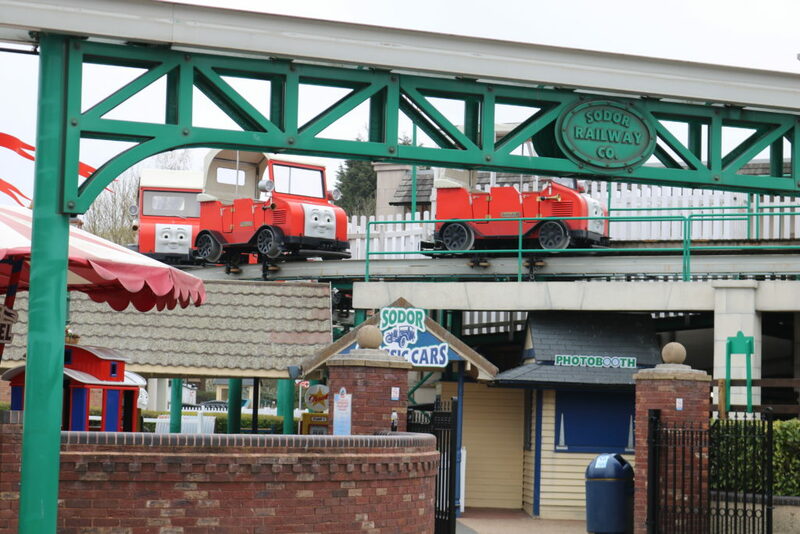 Bertie Bus, Cranky’s Drop Tower, Troublesome Trucks, Bulstrode and Toby’s Tram Express. 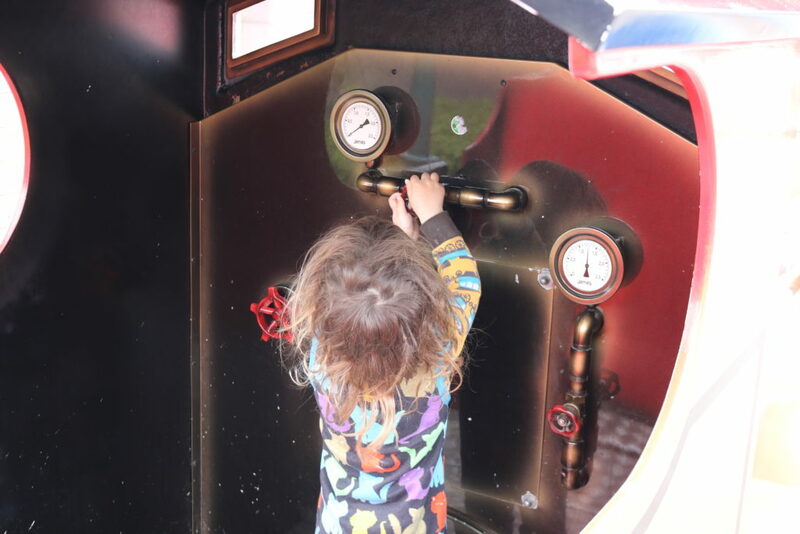 Sodor classic cars were not running so that left… Blue Mountain Engines, Captain’s Sea Adventure, Diesel’s Locomotive, Flynn’s Fire Engine, Harold’s Helicopter, Locomotive rides, James & The Red Balloon, Jeremy Jet’s Flying Academy, Lady’s Carousel and Whinston’s Whistle Stop Tours. He said his favourite was Flynn’s Fire Engine. I’m 36 weeks pregnant and only went on 3 rides. I did find the information on each ride really helpful because there are little icons of ‘not safe to ride if pregnant’ or ‘ride at your own risk’ these were really easy to spot and made it quick to see if I could go on or not. It was my own choice to go pregnant so I can’t really complain of how limited I was, I knew the price I was paying ahead of time and there is a £2 discount ticket for pregnant mothers but… I still can’t help but feel like I got ripped off. 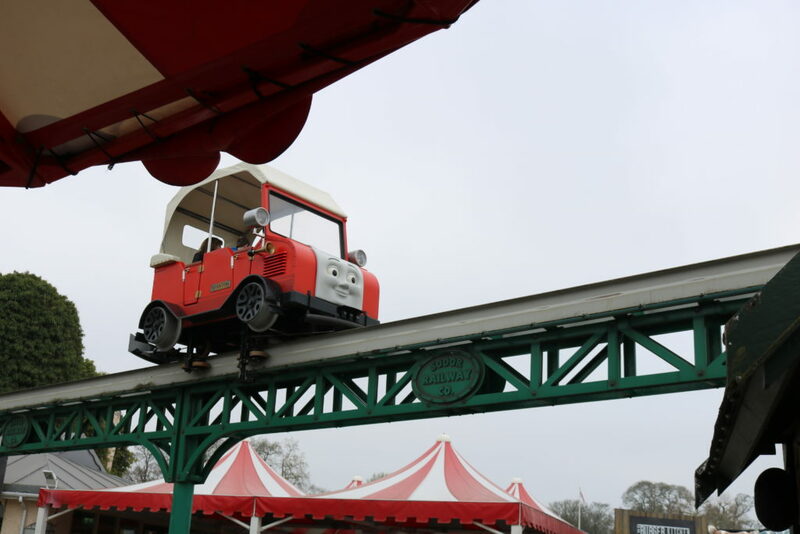 I spent most of the day watching Eric and Ollie go on the rides, lovely and all, but I really would have appreciated a cheaper ticket… £28 to watch them, enjoy 3 rides and see the other stuff doesn’t really feel like good enough value for money. £28 is a lot for what I experienced. 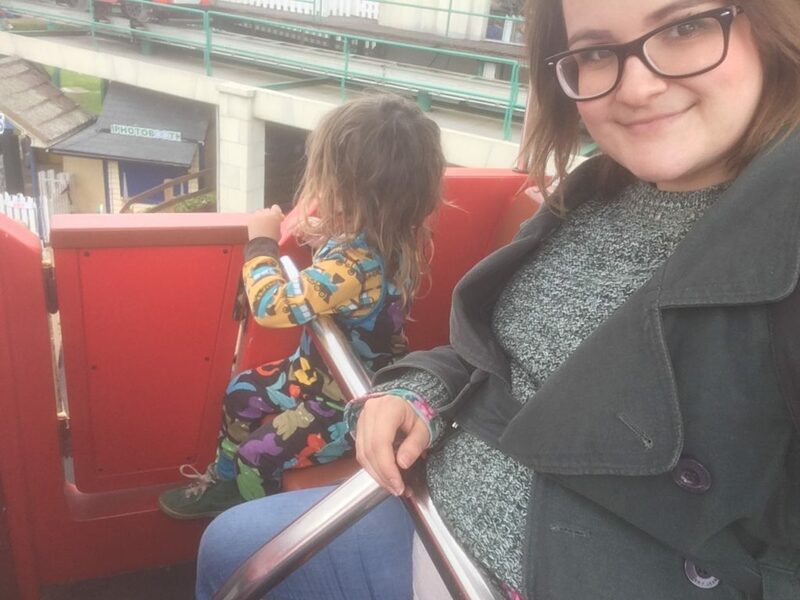 I understand they don’t want to discriminate against expectant mothers so it’s fantastic I did get to go on some rides, but for £26/£28 I would have preferred to pay a super discounted rate, or free and not gone on any rides at all to save nearly £30. 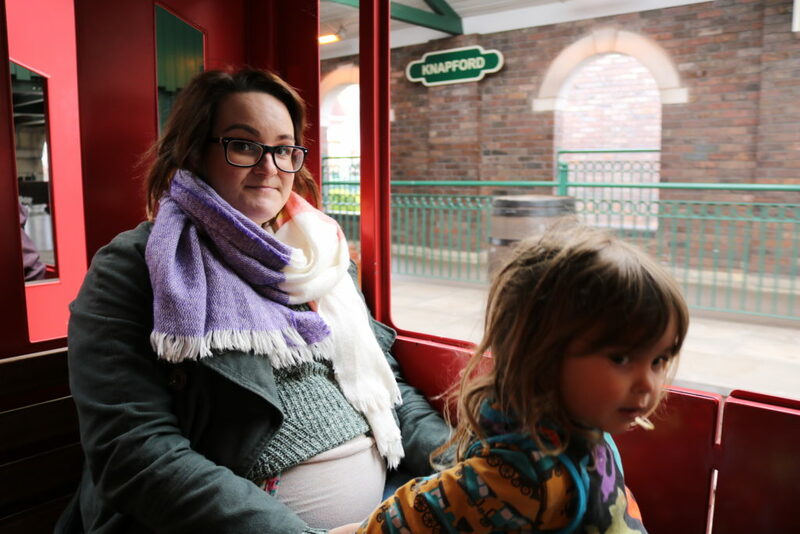 I don’t want to be *that* pregnant person and so, you know, I won’t grumble anymore; I enjoyed my day out and that’s that; but thought I would just give my 2 cents! My favourite ride by far was the locomotive. 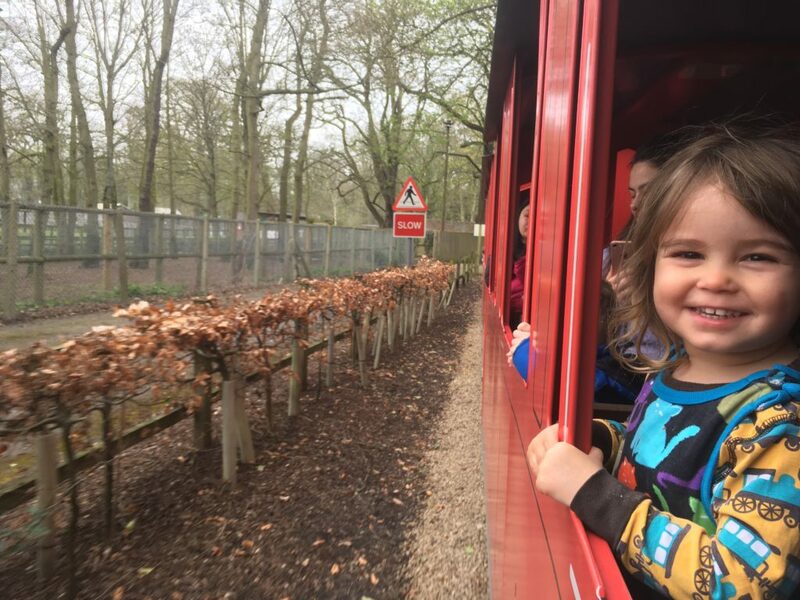 This is a train pulled by either Thomas or Percy and takes you to the other side of the park with Dino Trail, Thomas & Friends exhibition, Spencers outdoor play area and Zoo. 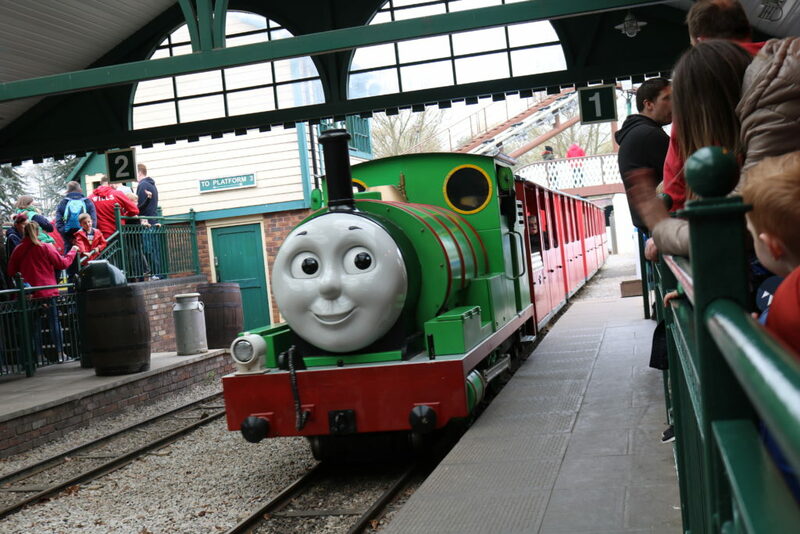 I LOOOOOVED the train ride, it reminded me of day out with Thomas and I wish we had gone on it twice. We were pulled by Percy and it was super exciting to see him coming down the track, turning around on the turntable, very cool. Throughout the day The Fat Controller comes for photo opportunities in front of the turn table, and before the rides open Thomas is fixed there for photos, as well. I had heard that the locomotive was the most popular and queues were expected however we only waited 5 mins for Percy to arrive then another 15 minutes or so for people to get off, Percy to go turn around and attach back on the front, and for everyone to get on. The carriages are long so it can take lots of passengers, you aren’t encouraged to share with other families, and there’s ones suitable for pushchairs. The ride itself could have been longer it was only a minute or so. How clean & modern it was. The rides seemed new and were clean, high spec, colourful, etc., nothing seemed broken or old. There were some rides not on that day (Cranky & Sodor Cars) but no other rides or “models” seemed tired or had bits missing etc. It all felt really new! The height charts/ride information/rules easy to read and understand. No queues! To say it was a weekend in April, I braced myself for queues and expected queues, longest for the Locomotive which I had heard was the most popular. But there was no queues… and by no queues I mean, maybe once or twice Ollie & Eric waited for the ride to go around once before it was their turn to get on but the rides don’t last for long anyway. We waited maybe 10 minutes for the locomotive but that was because Percy has to turn on a turntable and go back again so really, it wasn’t queuing in that sense. 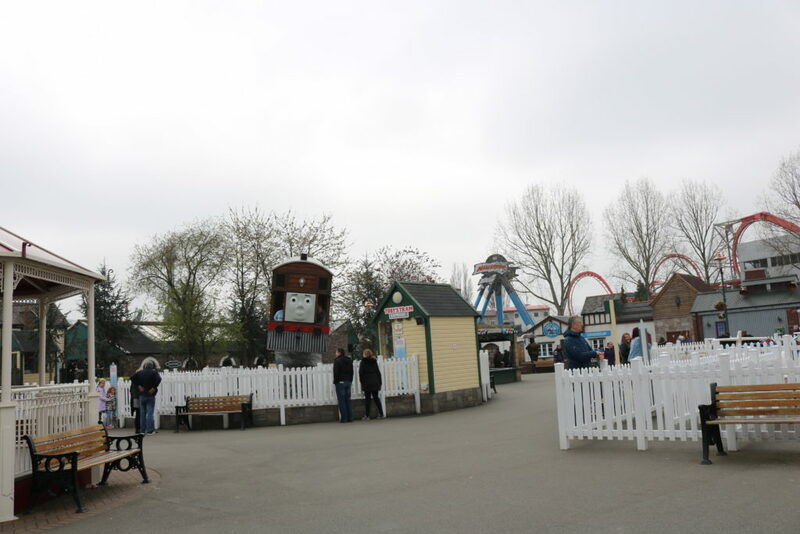 Thomas Land was the busiest part of the whole Drayton Manor park but it still was fine for queues and that was a weekend. Not an overwhelming amount of extra buys. 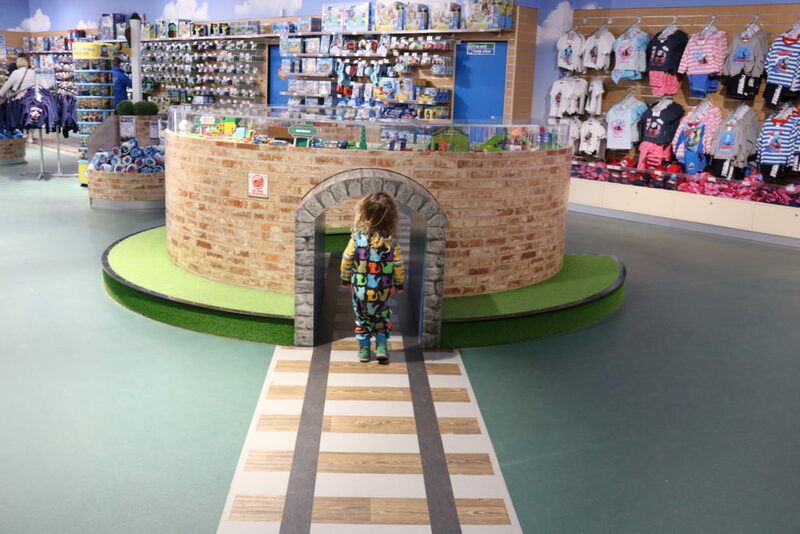 There are 2 shops and one of them calls itself the biggest Thomas & Friends shop ever, lol, it is big and very well stocked! We got Eric 2 trains and a book. The other shop is smaller and has more Thomas Land merchandise. There’s a hook a duck, a ‘throw the ball in the bucket game’ and 2 (I think) places to eat in Thomas Land if I remember, but other than that I didn’t see any other games or paid-for extras so it didn’t feel like we were being encouraged to spend even more money on top of the tickets. Speaking of buying extras, do note that if you ride on the Winston Whistle-Stop it brings you out through the big Thomas Shop on purpose! After taking a green screen merchandise photo. 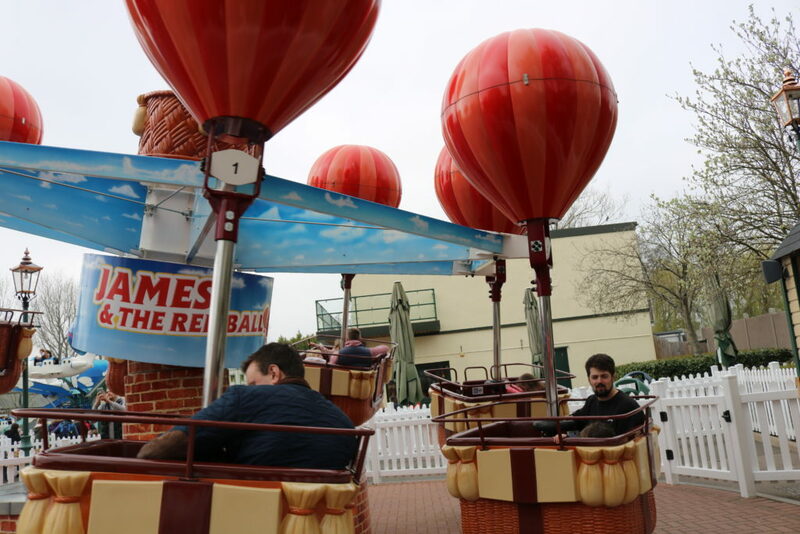 There is a big James engine on a pretend platform with some statues, next to the James & The Red Balloon Ride. Eric said this was his favourite part of Thomas Land! James is so shiny and you can stand inside him. Eric remembers this and keeps talking about it. 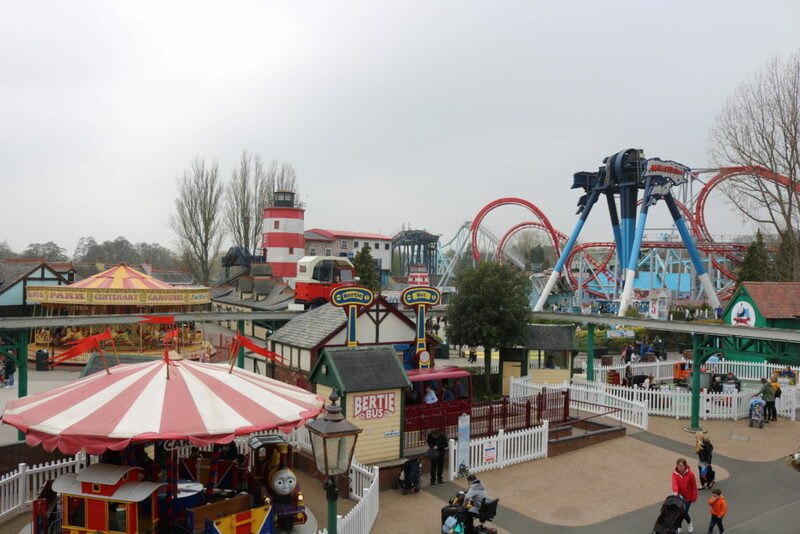 At Thomas Land itself there’s lots to look at… the rides are attractive and fun, it’s all bright and all the favourite characters are there., so you can be busy just looking at everything and watching the rides. 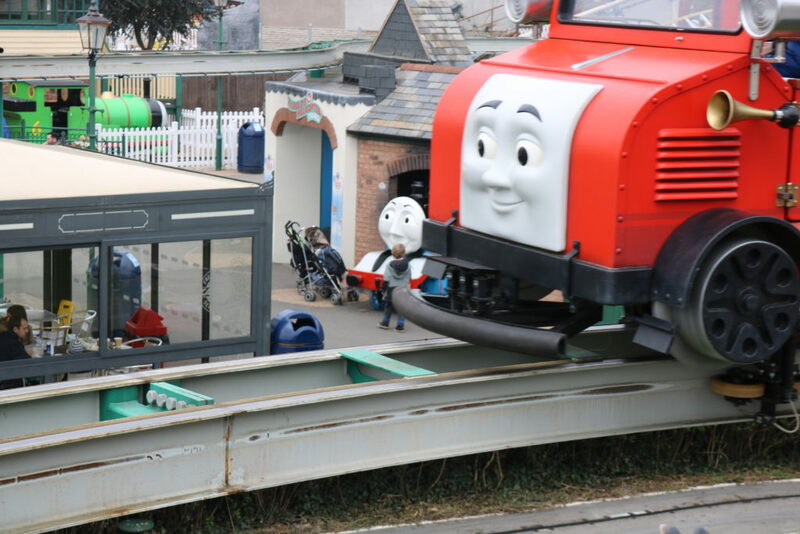 When we first got to Thomas Land Eric was really overwhelmed and didn’t like it, I think he was just taken aback by it all because it was quite a Thomas extravaganza with characters everywhere smiling lol, he probably was thinking what the?? We sat on a bench had some snacks and just took 15 mins timeout before going on some rides. 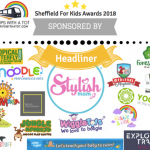 The soft play, Emily’s Adventure Play, is honestly not worth it if your child is under 4. And if they’re over 4 then they will have to play unsupervised as adults can’t go into the frame with adults. 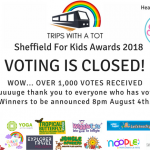 The ‘main’ soft play area (like any typical soft play centre) is for over 4’s only, I honestly thought this was really stupid given than the majority of children at Thomas Land are under 4. 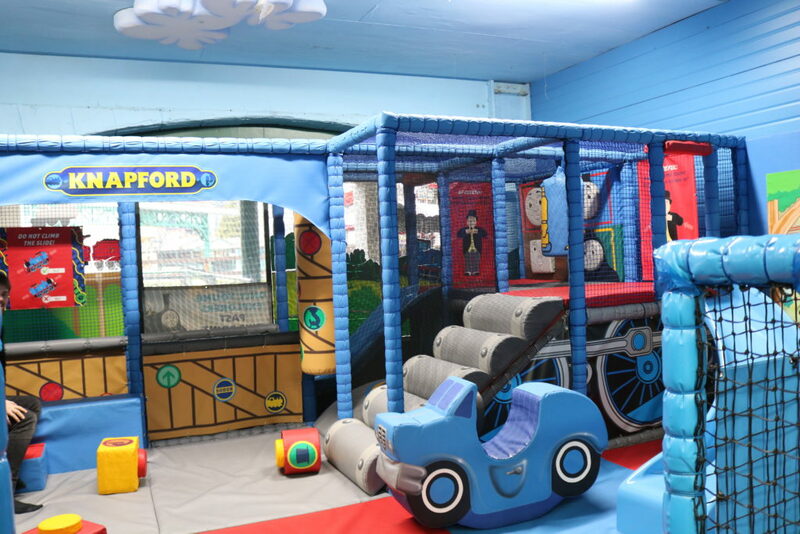 I know you don’t go to theme parks for soft play but there are windows to see into the soft play whilst you’re queuing for Winston’s Whistle Stop Tours. There’s also a maximum 15 min play time. 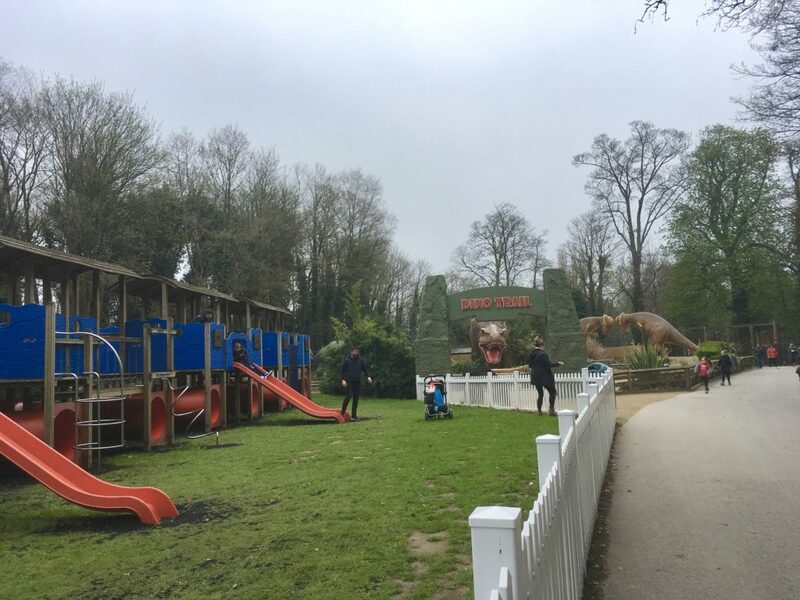 At the other side of the park (take the locomotive ride) is a Thomas Driving School Ride (minimum height 1m), Thomas & Friends Exhibition, Dino Trail, Zoo & Spencer’s Outdoor Play. We didn’t have time for the Thomas & friends exhibition, but we did the rest (besides the ride as Eric is not tall enough). There is a cafe here and lots of places to sit for a picnic. 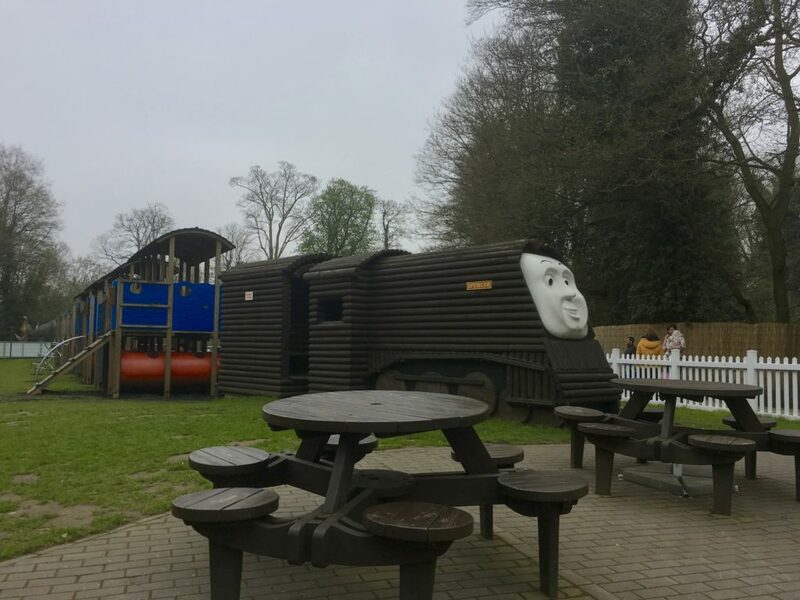 Spencer’s Outdoor Play features a bigggg wooden Spencer with a face; really impressive and you can sit inside him. There’s 4 picnic tables next to Spencer. 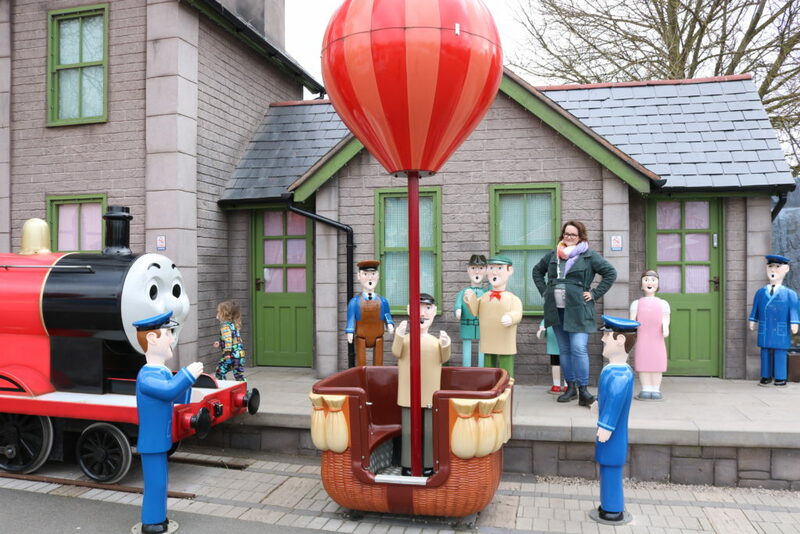 Apart from that the playground is just a regular adventure playground not Thomas & Friends theme; I do wish it had been more themed to Thomas and it was a bit in need of a refurb but I’m just being picky. Kids obviously can’t tell that and Eric had lots of fun. 🙂 It was just right for his age (3). 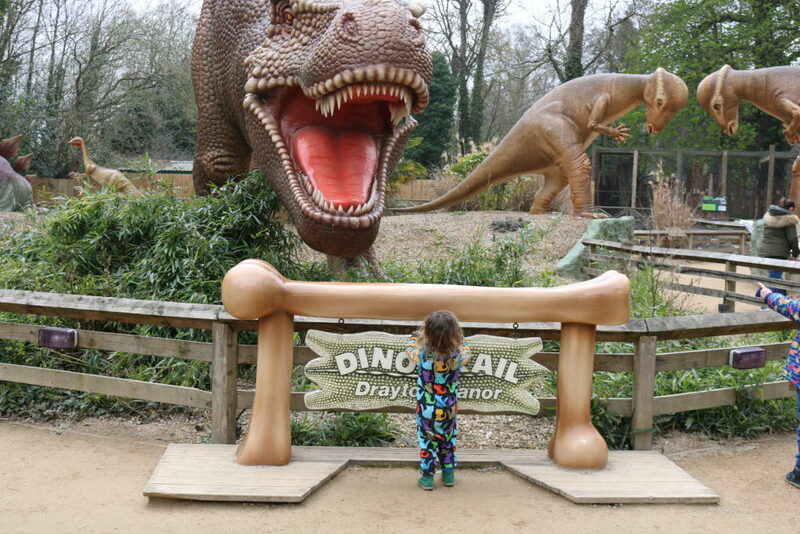 The Dino trail is great fun! 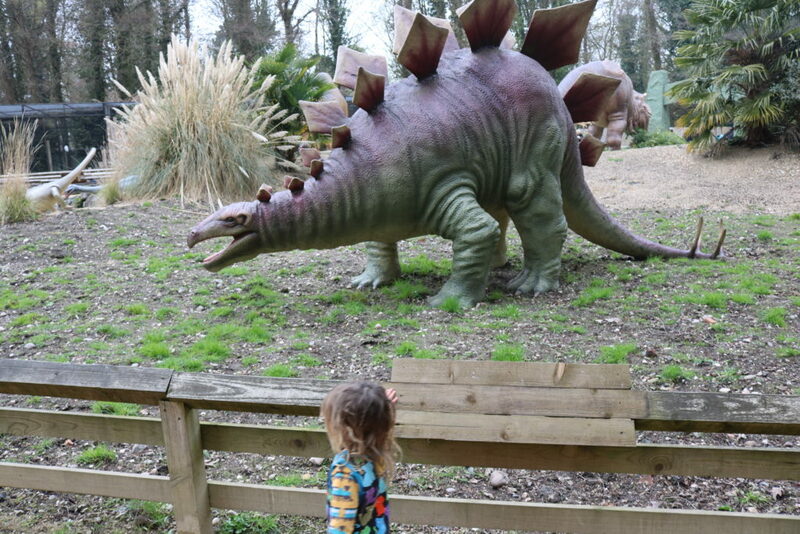 The dinosaurs don’t move/make any sounds so it’s good if your child would be scared of that. It’s a small trail but many different types of dinosaurs and Eric really liked this part. Next to the Dino Trail is the zoo… apparently it has many acres and over hundred animals or something but I’m not a fan of zoos in general… not sure if it’s because I’m vegan? But I thought it was very dirty, smelly and I felt bad for the animals to be honest… the cages in the monkey trail seemed really small. I’m not going to ‘review’ the zoo because I don’t think it’s fair I give them bad comments when I’m really not a zoo type, but safe to say we were only there for 10 mins. I’m sure if you love zoos it’s fine. 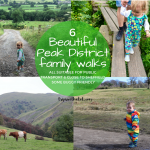 The whole day was taken up doing the above and then we had to leave to get a train back to Sheffield, the park would have been closing in 1 hour anyway and we arrived at opening time so got a good full day out. Ollie went on 2 ‘big adult’ rides a rollercoaster and in the air spinning thing (lol sorry for my bad descriptions). 2 rollercoasters were not working and a few other big rides out of order. I wasn’t very impressed with the rest of the park and if I was going without kids I would have been really disappointed to pay that amount of money on a weekend and not even all the big rides were open. 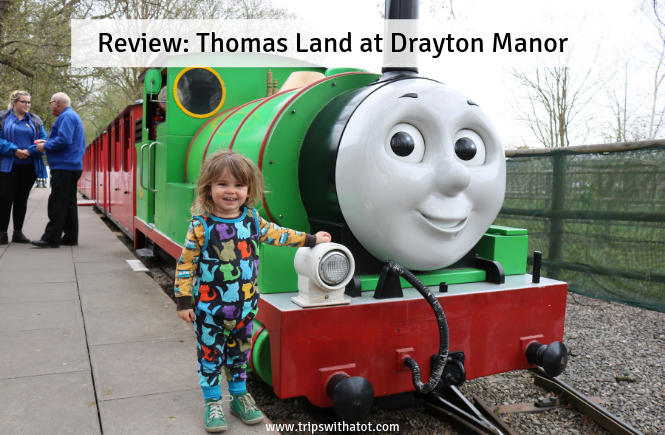 It seemed quite dated and not much to go on but, it’s obvious the main attraction of Drayton Manor is Thomas Land. 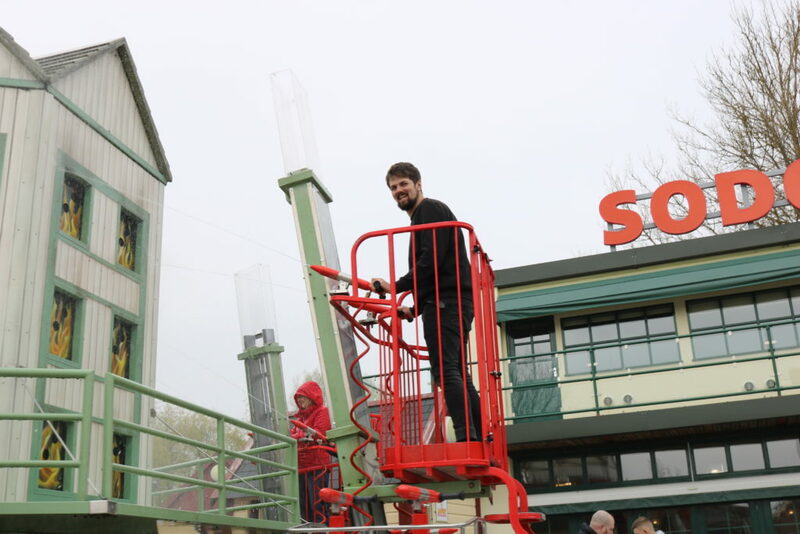 On the plus side Ollie didn’t have to queue for the 2 rides he went on… he literally walked onto the rollercoaster and sat on the front row, haha. Thomas Land has a hotel and I think if we were to go back we would do the stay and play deal. 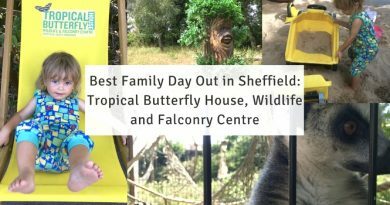 That may work out cheaper than how we did it (2 adults, 1 child tickets with online prices, plus hotel separate in Tamworth: Holiday Inn Express). 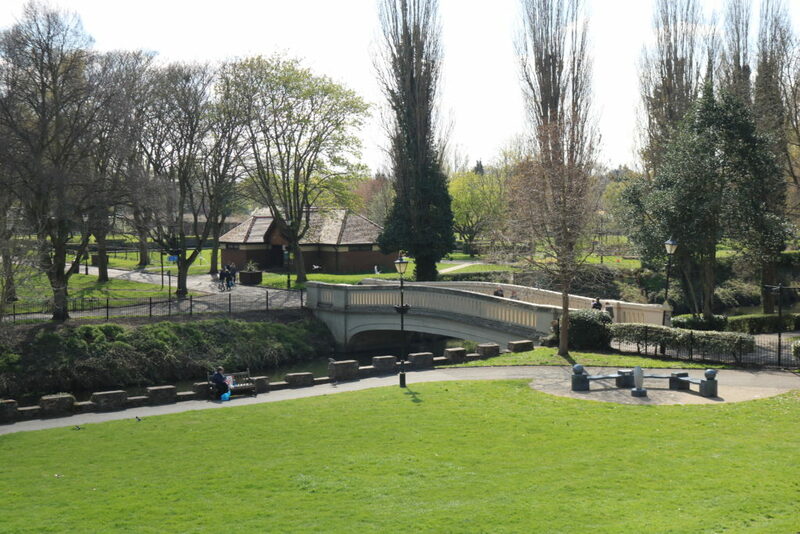 The location of Drayton Manor is fantastic, really… it’s only 1.5 mile away from Tamworth. 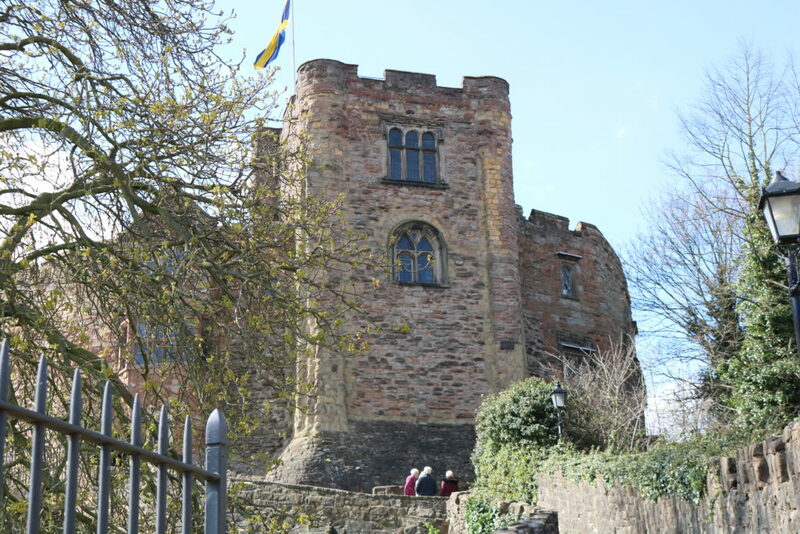 Tamworth has lots of places to eat, a train station, a castle and pleasure grounds with adventure playground (castle and pirate ship! ), Snowdome, leisure centre, retail park, cinema and markets. 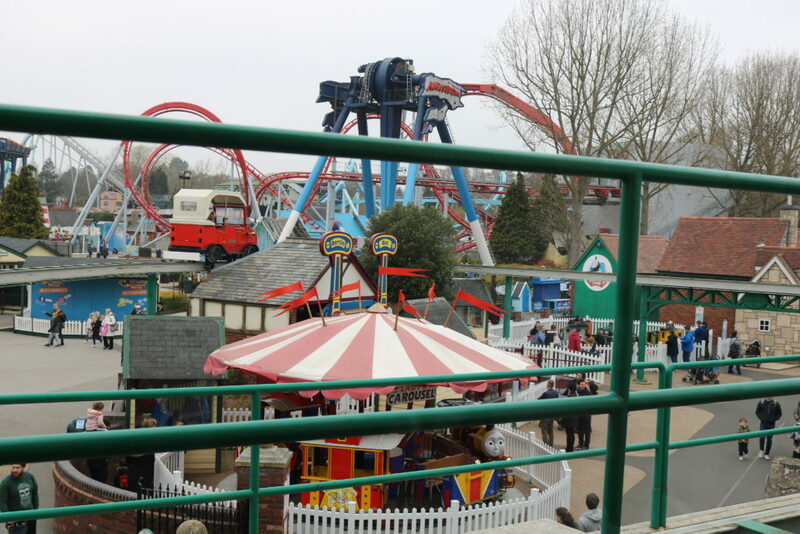 It’s convenient to get to Drayton Manor and stay in Tamworth the night before which is what we did. 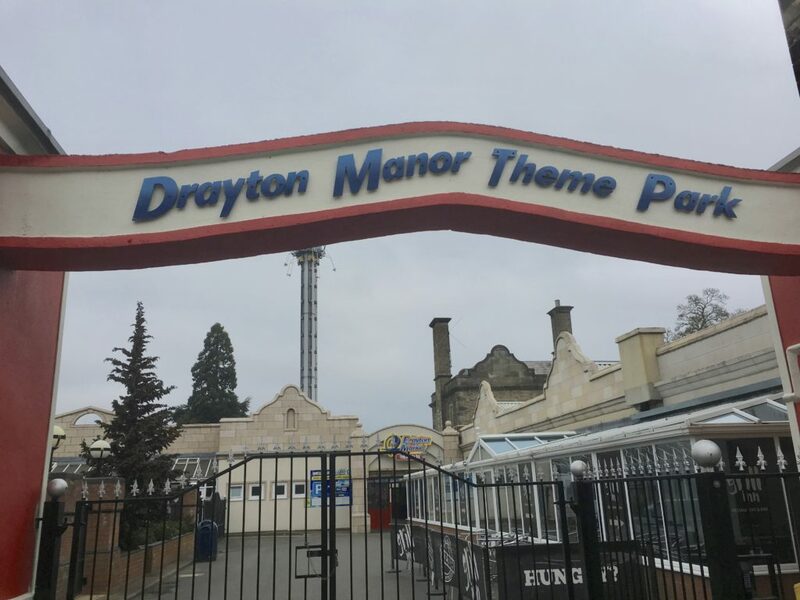 There are buses to Drayton Manor from Tamworth bus station but we got a taxi as the buses didn’t run on Sundays – £8 each way picked us up from the hotel and drops you off outside main gates at Drayton Manor. Trains from Sheffield to Tamworth are not extremely cheap, but we booked last minute and with railcard was about £30 for both of us – each way – so roughly £60 in total. It only took around 1 hour and a few stops. 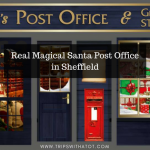 If you got up really early and set off at the crack of dawn, you could possibly get to Thomas Land for opening time and back to Sheffield again but we stayed over the night before to get a less stressful experience, lol. Plus there’s a few things to do in Tamworth. It was a special day out, one I’ll never forget. Don’t think any of us will forget it and the photo of Eric with Percy I’ll treasure forever! For Thomas & Friends fans it is fantastic, and I really was impressed with how ‘real’ everything was. 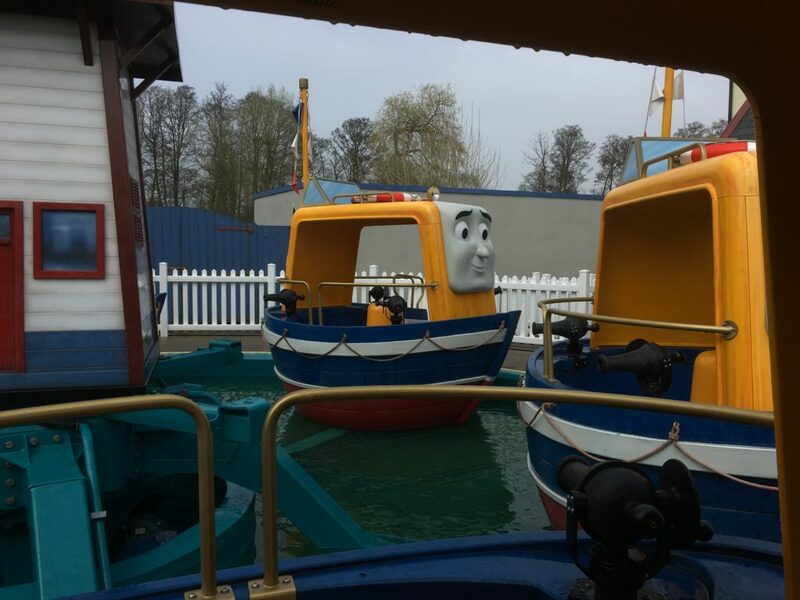 The rides are very high quality and I loved how there’s so many different characters, it’s not just Thomas over and over. I would go back but let me start saving now, lol. It was so expensive and for that reason I’m a bit put off. I just can’t seem to justify it, even if we went term time it still would have been over £50 for both parents and only 1 toddler. But… you know… experiences like this they cost a lot so sometimes you just have to bite your tongue and pay it. 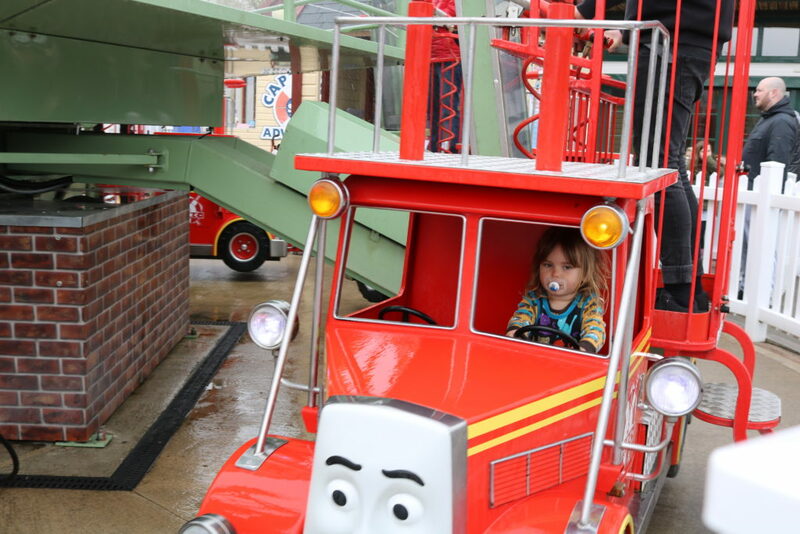 This is a lovely day out for special occasions, families, etc., but I wouldn’t recommend it for anything other than Thomas Land and it might be tricky taking a toddler/pre schooler and a teenager. 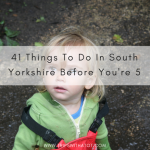 I wouldn’t bother with the indoor play area unless your little one is over 4 and confident to play alone. 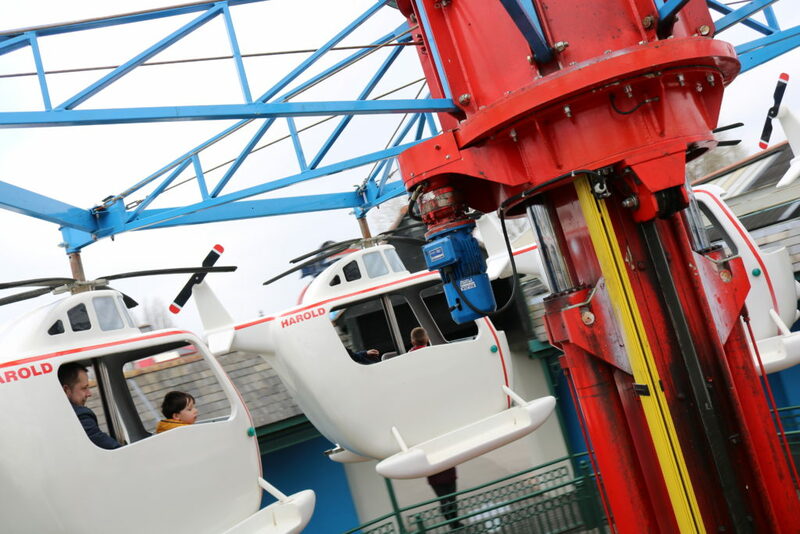 Take your own food, don’t worry about queues and be prepared for the toy shop if you go on the Winston’s ride. Also take into consideration the height restrictions if you think this may be a problem. I think you need a full day to get the most out of your money, we arrived at 9:30am but Thomas Land rides don’t start until 10am. The half an hour before rides open was great to look around and take photos. We didn’t leave until gone 4 and so many other toddlers were walking around falling asleep at that point, lol. 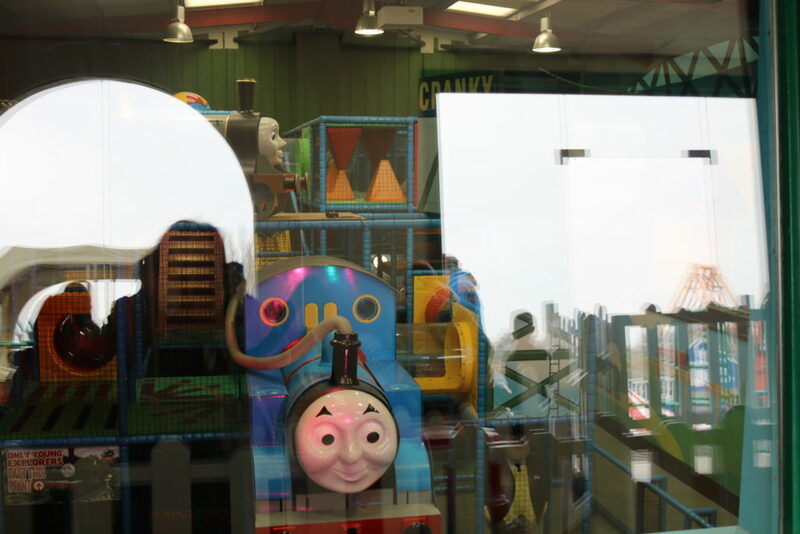 Have you been to Thomas Land?